A previous group moved the costs associated with street drainage over to our water bills so those amounts don’t show up in our taxes. Then a later city council voted to charge our water utility a multi-million dollar franchise fee that was subsequently added to our water bills. What will they do this time? This entry was posted on Thursday, March 9th, 2017 at 5:00 AM and is filed under City government. You can follow any responses to this entry through the RSS 2.0 feed. You can leave a response, or trackback from your own site. I am seriously puzzled why the Feds haven’t been investigating this tax payer funded scheme. It’s past time for a major perp walk. I agree! The Mountain Star group of investors are involved in all the government projects that generate a lot of money such as Southwest University, the Cardwell Collaborative or Medical Center of the Americas, to name a few. The chickens are coming home to roost.Here is the truth the CC is hiding. THE CC IDIOTS HAVE BANKRUPTED THE CITY OF EL PASO!!!!!!!!!!!!!!!! Also major tax increase will only beat back the wolf from the door for only so long. Then again the CC has the back door of the EPCAD and Kilgore they can count on to even raise your taxes even more as the CC claims they did not raise taxes. Just more El Paso Stupid,El Paso Proud in the great progessive paradise of EL Taxo Texas. What will they do next time, you ask? Don’t know but I do know what they won’t do, stop spending, cut expenses. You are being very nice-nice with the inflation. That should be included in the cost. The Pols like our Former CFO’s fussy math since Petra just goes on and on. I thought all these projects were to be paid out of increased business property values. Maybe they can tap the excess HOT? To prove just how insane the city council and city management are, they now want to add tens of millions of additional debt without a vote and to be repaid for out of the general fund. Oh, and it’s partly to help complete some of the Quality of Life (the name alone is humorous) projects that can’t be completed because the current EPISD CFO and her former boss underestimated the cost of those projects. Yeh, like another aquatics center is going to make a difference in my life. I agree with Oscar Mayor who told council he will veto that debt and said El Paso “constituents deserve better.” That’s a great phrase. Oh wait! That’s Brutus’s line. I’m another ‘tol’ you so person, and cannot express just how disgusted I am with our elected representatives. Maybe if we just called a complete moratorium on all this tearing down and building and buying of homes at taxpayer expense, we could get a grip on this crap. These LIKE Buttons. . . do not work well. You have to sign into something. Posting is AUTOMATIC and easy. The “LIKE Button” is . . a bunch of time wasting. Told you so . . . told you so . . . told you so . . . But . . . I was not . . .HIRED . . . to do that. The ones in office are not there because they KNOW SO MUCH. It’s because they got elected. Period. Thru deals, & thru special interests funding their campaigns, etc. What a wacked out way to run a city ! Hun ! We crazies predicted this years ago when City Council started its spending spree with the ballpark and Q of L bond. 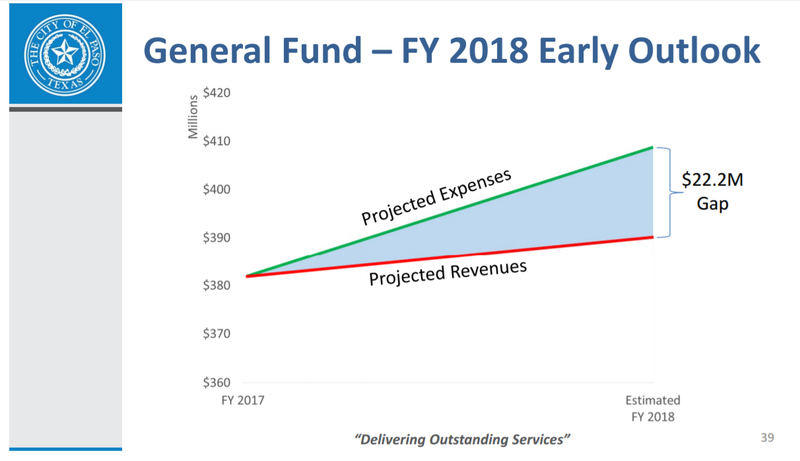 Sooner or later “the we’ll pay for the overages out of the General Fund” strategy stops working. Love the slogan at the bottom of the slide. If they were delivering outstanding service we wouldn’t be out of money. Perhaps they mean delivering outstanding service for our local politicians’ donors.